When Windows 8 was first revealed and Microsoft were showing off the capabilities of the operating system, one of the devices that stuck out was the table PC. Lenovo has decided to make the table PC and while some are still sceptical, the new table shows real innovation. Lenovo has spared no expense in making this a top range PC, which it needs to be for its huge size. At 27-inches, the screen is almost three times as big as the iPad. The PC is an all-in-one, meaning all the parts are inside the case. The PC comes with an Intel Core i7 processor, Nvidia GeForce Graphics and the screen is full 1080p HD. For the size of the device, it is still quite slim at 1.1-inches thick, although it does weigh in at 17 pounds. An interactive table is an interesting idea and one that may soon be used in many areas. Meetings can be held with the table showing all data and information. Restaurants will allow you to order food off the table. There are plenty of ideas that developers may be able to add to this. Right now, Lenovo and Microsoft are treating the PC as one for personal home entertainment and gaming. Ubisoft and EA have both partnered with Microsoft to bring some games onto the operating system. Software wise, this PC will be the same as any PC running Windows 8, with a few games and applications suited to the larger screen. In early views news, music and video files all seem to function well, with no tear or pixelation. The PC table, named Horizon, will be on sale this summer in the US for $1,699. There have been no details about expansion to Europe or Asia. 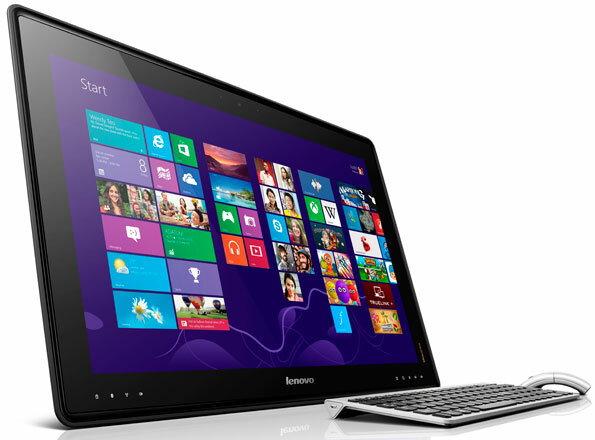 For now, we suspect Lenovo want to just test the table PC, before branching out.